TRUE FACT: No item of apparel makes the leg look as fabulous as wearing a stiletto heel. ALSO TRUE: Nothing makes your feet as sore as wearing a stiletto heel. What is a fashionista to do? We want all the pretty without the pain. Whether you have a stiletto shoe obsession that leaves you with throbbing feet or you stand on your feet all day at work, your feet could use some TLC at the end of a long day. This is why we love the Wollin Shiatsu Foot Massager, like a masseuse in a box, it is an effective, therapeutic treat for sore feet. Our feet take a beating each day. Have you ever a had a spa massage that the masseuse worked all the tension out of your feet? Feet are surprisingly sensitive for such a durable body part. Unless you get regular foot massages, feet tend to carry a great deal of tension in them. I’m always surprised at how much better my feet, legs and even my back feel after a masseuse spends a few extra minutes focusing on giving my feet a deep massage, shiatsu techniques are particularly effective. I even sleep better with relaxed feet after a massage. If I was rich and famous, I’d get daily foot massages. But I’m not, so a massage device of some sort will have to suffice. There are various contraptions and devices to apply a kneading, rolling or acupressure on the feet, but these tend to only reach the surface layers of the feet and do not work well on the toes. They also require some way of holding them in place snugly against the foot or a manual application of pressure on the foot to use them, which is not very appealing at the end of a long day. They also typically do not massage the top of the feet or get between the toes. There are the massage chairs that apply air pressure to the feet, but these are expensive and take up a lot of space and are not attractive as furniture. Wollin Shiatsu Foot-Massager is a sturdy device that can be easily lifted and moved by its built-in handle. It is easy to clean when needed. It has soft cushioned compartments to place the feet, and a push button menu panel to customize your options. Options include a timer, intensity mode, and heat or no heat. There is an easy to read timer display. It fits the feet size of both women and men, up to men’s size twelve. The massager has a white base with colored accents in blue, green or pink. Each foot gets its’ own wide, long, comfortable massage compartment that fits up to men’s size twelve feet. The lining zips out and is washable. The massage lasts for fifteen minutes by default, or whatever time you set, unless you shut it off sooner with the touch of a button. You can run the massager twice in a row for a total of 30 minutes, but fifteen minutes most likely will provide a great deal of relief even with very sore feet. The LED display shows how much time is left on your massage treatment. The heat is warm but not uncomfortable. 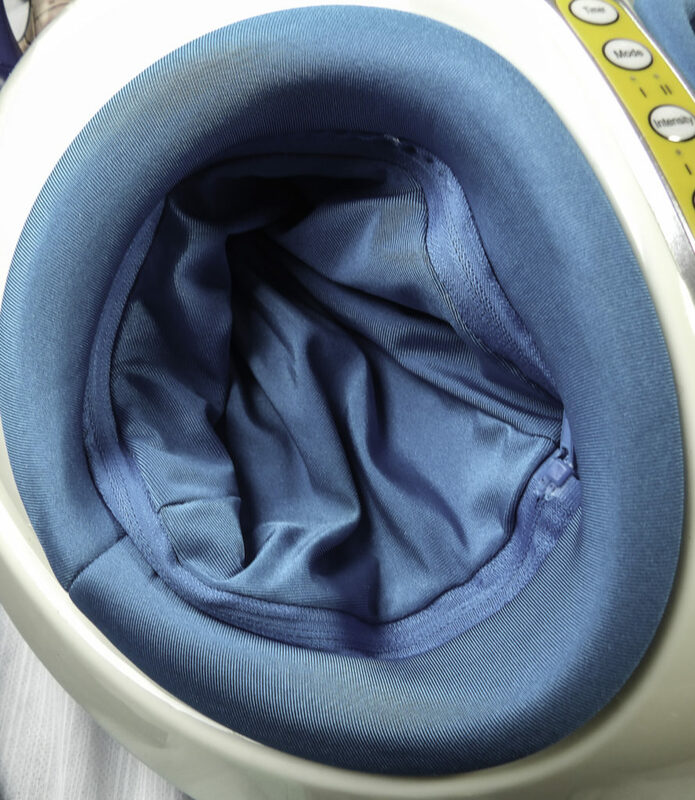 The heat option serves as a treatment feature as well as being cozy because it relaxes the muscles enough to be more receptive to the kneading work of the massager’s heads. The massage treatment is still effective without heat if you opt not to use this feature. Wollin has a three-stage process that incrementally increases the pressure and strength of the massage treatment, penetrating deep enough to relax muscles and increase circulation. The massage function itself uses multiple massage techniques that do feel similar to an actual masseuse’s method of treating tired, sore muscles and soft tissue that is stiff or even rigid due to over-exertion. There are kneading balls that feel similar to the firm pressure strokes a masseuse does with their knuckle, that works on the bottom of the foot, heels, and the toes. There is intermittently increased and released air pressure on the top and sides of the foot similar to an acupressure technique. I really enjoyed that it periodically focuses on working on the ball of the foot near the base of the toes, and the individual toes, that’s something I have never experienced even in a very high-end foot massage device. Something else that is superior about the Wollen is the massage is not just a vibration, it is an actual kneading motion that is highly effective. 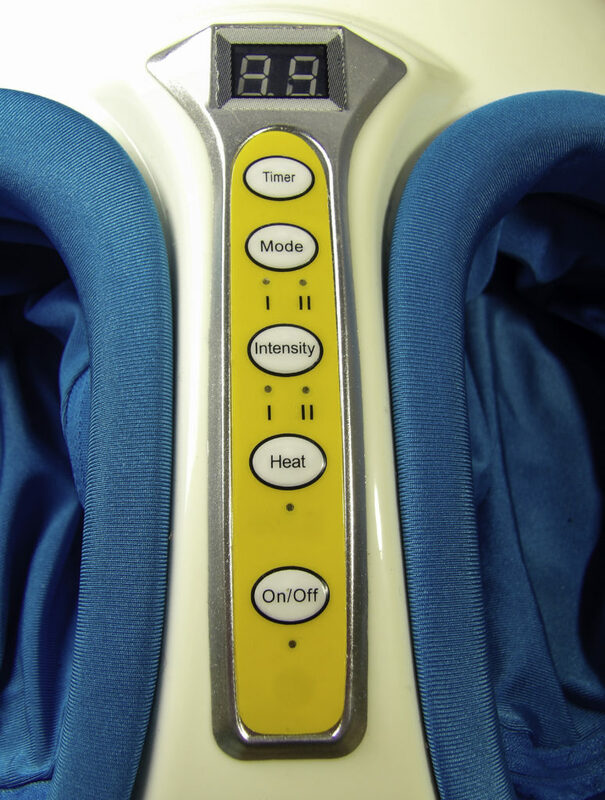 The dual Intensity modes allow for a custom massage treatment. Some prefer a softer slower place to work out tension and sore muscles that are achieved on with Intensity Level One. Level two is a deep, more robust stroke on the feet that works out the kinks. Neither mode is painful, but if you have a particularly sensitive or sore spot, the Intensity Two mode will have a few brief cycles that deeply kneads the toes and the balls of the feet. It is similar to how a massage therapist might work out a muscle knot for about ten seconds and release it. If you find the massage treatment to be too intense at any time, you can instantly switch modes or shut it off. Customize your massage with the Timer, Intensity, Mode, and Heat options on the menu panel. 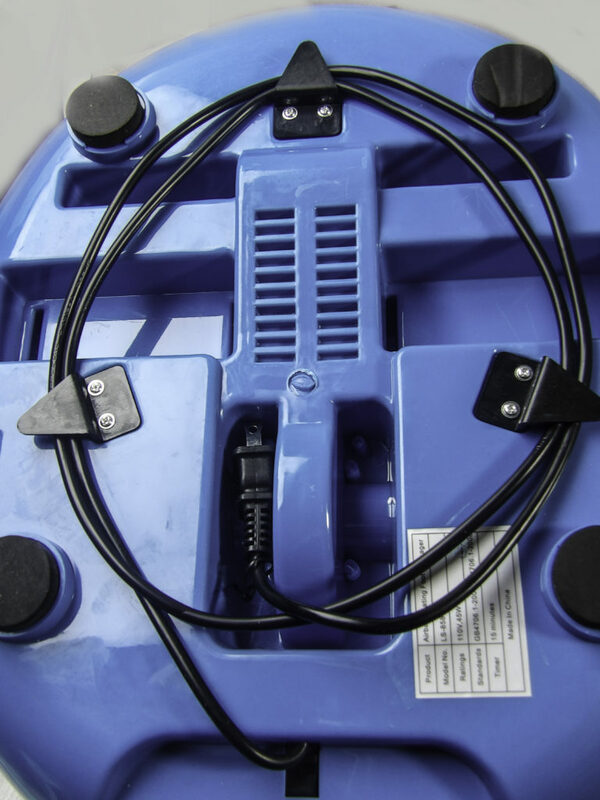 Despite a powerful motor, the massager runs quietly and does not disturb others in the room, making it ideal to use while watching TV, when on the computer, or before going to bed at night. This is a wonderful massage! Much more relaxing than devices and gadgets I have tried in the past, I found that it quickly alleviated pain and soreness from standing on my feet all day, and the stiffness I feel in my feet, including the arch, after wearing a stiletto heel. I use Intensity Mode Level One as a gentle, relaxing massage right before going to bed. I find I sleep better with less tension in my feet and when the feel nice and relaxed. After a long day of standing, walking or wearing uncomfortable shoes, I like to come home and use Intensity Level Two to work out the kinks. Sometimes I vary this pattern, but mostly this is what works best for me. The Wollin Shiatsu Foot Massager is a highly effective device that delivers a spa masseuse quality foot massage, including effective results for the heels, the balls of the feet, the toes and even between the toes. I particularly like that the massage benefits are long-lasting, not just something that feels good while I am using the device. The rolling kneading balls are the ideal size for addressing the kinks and stiff muscles on the feet. The menu panel has easy to use buttons to select a massage suitable for your needs, and it fits feet up to a man’s size twelve comfortably. 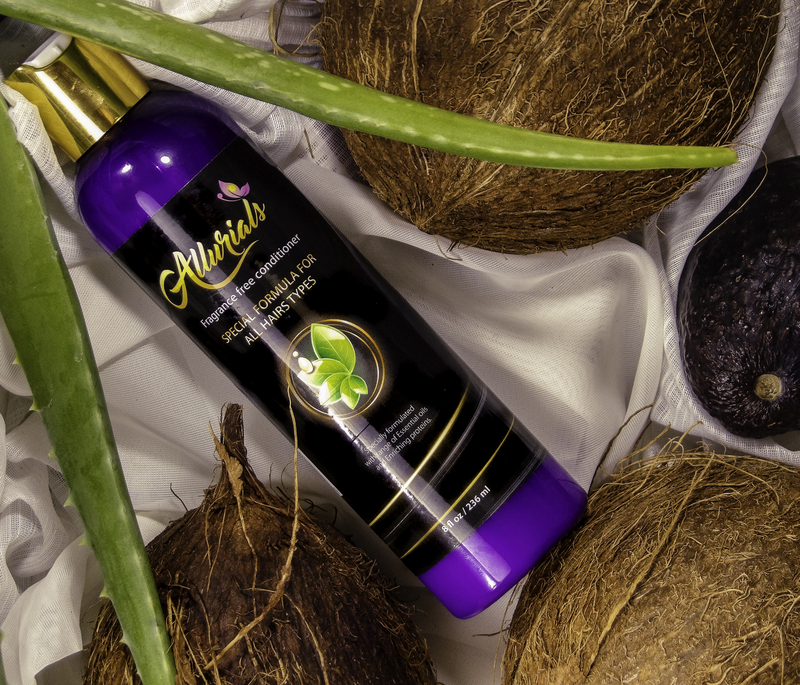 It is an excellent value and a price point that makes a great gift for yourself, a mate, or for someone who stands on their feet all day at work, a new Mom, or anyone you might want to pamper with something to make them feel relaxed and special. The Wollin Shiatsu Foot Massager gives spa-quality massages, even every day, for the cost of less than a one-hour massage plus tip at a spa! 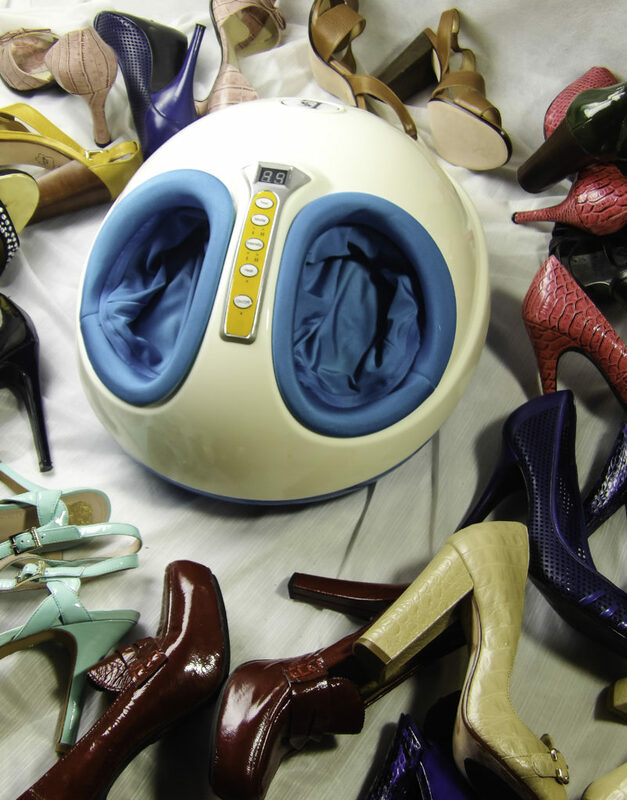 If you experience discomfort and achy, throbbing feet after a day wearing heels or an evening out dancing, the Wollin Shiatsu Foot Massager can make your feet feel better in no time! Style Chicks received the Wollin Shiatsu Foot Massager in exchange for our unbiased review and received compensation for our time and effort. However, our experience with the product and the opinions expressed in this review are 100% ours. Posted by Style Chicks / Filed In: Beauty, Body, Shoes!